This happened in 1797. It was at that time the first absinthe factory was built. The establishment was created under extremely modest conditions, even for Couvet; the building where the industry was born still exists; it measures eight meters long by four meters broad by four meters high. 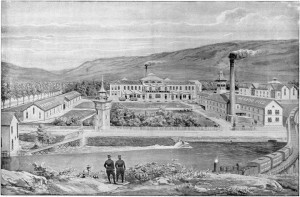 Subsequently enlarged, the factory was not long in becoming too small and, in 1805, Mr. Pernod not being able to satisfy demand by the French customers which had taken to his product with a marked favor, fixed upon Pontarlier as the place to avoid the high taxes levied by the tax department upon Swiss Absinthe. We have before our eyes the contract dated the 25th day of the fifth month of the 13th year (French Republican calendar) by which Sir Benoit-Hilaire Courbe leases to Pernod & Sons for the price of 180 francs per year, a location designated as a house on Grand Street in Pontarlier, for the establishment of a green water factory. This tiny distillery could hardly foresee the splendid establishment which rises today at the edge of Doubs: two small apparatuses producing 16 liters per day each. When Mr. Louis Pernod, currently still one of the heads of the house, and his brother, Fritz, unfortunately since deceased (March 17, 1880), took over the direction of the business in the absence of their father, whom they had lost early, the house was already on a good road, because the daily production had reached the figure of 450 liters.